At the Georgia Undergraduate Research in Psychology Conference in April, Jose Martinez presented his research titled “Age Moderates the Relationship Between Dispositional Narcissism and Adult Attachment Styles.” The same research paper also won first place in the Psi Beta 2018 Anastasi Research Paper and Conference Travel Scholarship Competition. When more than 10,000 psychologists and students gather at the 126th annual American Psychological Association convention in San Francisco on August 9, Jose Martinez will represent Palm Beach State College with distinction. The Dr. Floyd F. Koch Honors College student will attend as the first-place winner of the 2018 Anastasi Research Paper and Conference Travel Scholarship Competition, sponsored by Psi Beta, the community college national honor society in psychology. In addition to the all-expenses-paid trip to the APA convention, Martinez will receive a $600 scholarship award. He is the first PBSC student to enter the competition, let alone win it. This is just the latest academic accomplishment for Martinez. This past spring, his research was accepted by the Georgia Undergraduate Research in Psychology Conference at Kennesaw State University. Solely representing Palm Beach State at the GURP conference, Martinez presented his research at a poster session, alongside undergraduate and graduate students from southeastern colleges and universities. The research paper looks at the relationship between dispositional narcissism and adult attachment styles. According to Ted Cascio, Ph.D., PBSC psychology professor and Psi Beta chapter advisor, it’s well-established that narcissists often don’t fare well in long-term romantic relationships, but researchers had yet to thoroughly investigate whether narcissists have different types of attachment patterns with their partners. As defined by the APA, attachment patterns are established in childhood, between a child and its caregivers, and set the general tone for future relationship patterns and interactions. 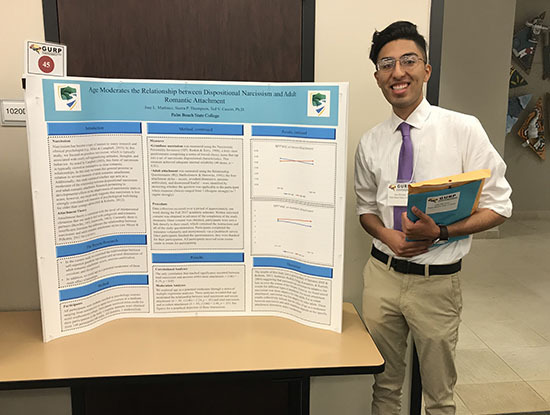 Martinez will also present his research at the Psi Beta Student Research Poster Session at the APA convention and will receive an award certificate at a reception sponsored by Psi Beta and CABE, the APA’s Committee on Associate and Baccalaureate Education. Dr. Ted Cascio and Jose Martinez celebrate at PBSC’s 2018 spring commencement ceremony. Martinez, who finishes his A.A. degree this summer, will attend FSU this fall. Martinez graduates this summer with an Associate in Arts degree and heads immediately to Florida State University as a junior psychology major. During his time at PBSC, he held offices in the Phi Theta Kappa Honor Society and the Honors Student Advisory Council, was co-president of PBSC’s Psi Beta chapter, and was one of six PBSC students named to the 2018 All-Florida Academic Team. He also received two PBSC awards this year, one for his service to the Psi Beta chapter and the Psychology Award for his research. A graduate of William T. Dwyer High School in Palm Beach Gardens, Martinez, 20, was drawn to psychology when as a new PBSC student, he was struggling to decide on a career path. Cascio agrees. “Jose has shown more initiative than I’ve ever seen in an undergraduate student. His work ethic is almost supernatural. He epitomizes the American dream—somebody who works hard and can be successful and make things happen as a result of that hard work. 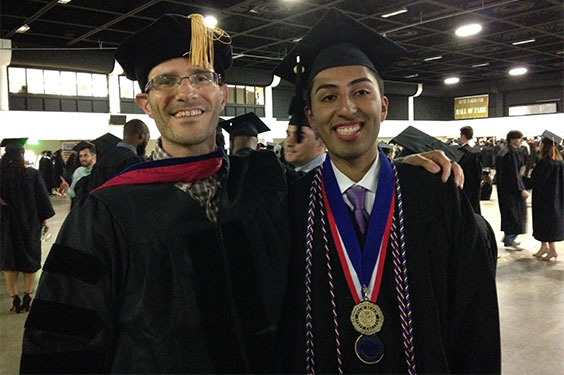 The encouragement of his professors has no doubt contributed to Martinez’s achievements and positive outlook. Well done, Jose! Congratulations on this accomplishment and may you have great success in your future education and endeavors. Congratulations Jose! I am very proud of your hard work and success! Good luck at FSU! Congratulations on your accomplishments-Way to go Noles!